The DMG GameBoy Pitch modification have been available for some time now and many discoveries were made. For instance, it has been verified, Thanks to Anthony from Nonfinite, that cutting of the crystal trace is NOT necessary. 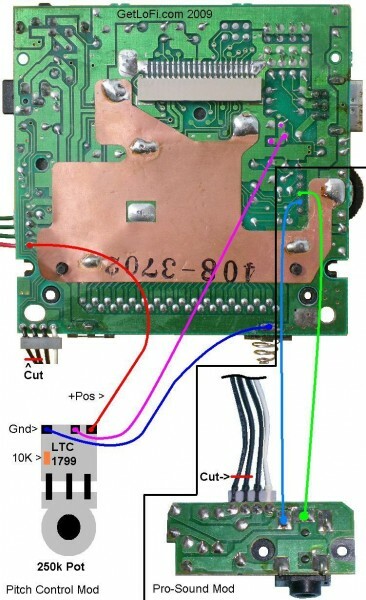 The output from the LTC can be connected directly to the xtal element and the main CPU will respond without problems. Adding a 10K trim Resistor is also required to keep the unit from crashing. On the NEW LTC Gameboy Kit board the Resistor is mounted directly. The 250K potentiometer seems to be an even better choice for the usable tempo range. The Kit also includes a segment of thin and flexible high quality wire-wrap wire to make the installation easier and it can be used for doing a variation of the Pro-Sound mod with the original Headphone jack. The entire process only takes about 15 minutes and the a new GameBoy Pitch Modification Kit includes everything needed! Available only from the GetLoFi Shop. Please note that in the video I do install the crash proof resistor, but that is only necessary when using the regular LTC Modules.